Brave New World: Are Tablets Becoming Cheap Ticket Commodity Items? Are Tablets Becoming Cheap Ticket Commodity Items? We are starting to see a real convergence in the mobile device market. Tablets are shrinking with 7 inch now becoming a norm and smartphones are growing with 5.5 inch being just the starting point. We are also seeing tablets starting to become real throwaway commodities with prices now falling to under £100 and the big retailers starting to own brand and go after the market. The challenge for many tablets is how they can now maintain a high price ticket yet offer little extra value over their cheap and cheerful counterparts? They have the same operating system, same apps and let’s face it aren’t that different. There will always be the ‘tag hags’ who buy the label to be seen with, but today more and more people want value, or a price that is a throw-away. The major UK retailers are developing their strategies to compete not with each other as much as with Amazon. Expect to see more compelling tablet ‘own label’ devices as we approach Christmas. Interestingly, smartphones still retain a relatively high ticket. This may be down to many people being on fixed tariff contracts, or that the real choices are covered by but a few and that this scarcity of real offer maintains the high price. So is it about ‘tin’, apps, context (search and discovery), or content? Some will say that it is now about brand and market share and that these other elements are merely sub-brands that support the major brand. The moves in the UK by Tesco and Argos have certainly made a clear statement re the price of tablets and it will be interesting to watch how those who live on greater margins but far narrower range react. Certain market segments, such as education, can now face a welcomed challenge, or an opportunity, where they can buy bulk and cheap and move forward, as opposed to buying expensive labels and fighting budget cuts. 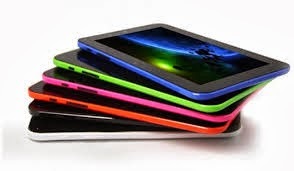 The entrance of cheap tablets may deliver that one laptop/tablet per child to UK schools, which in itself may change the digital journey for all of us.